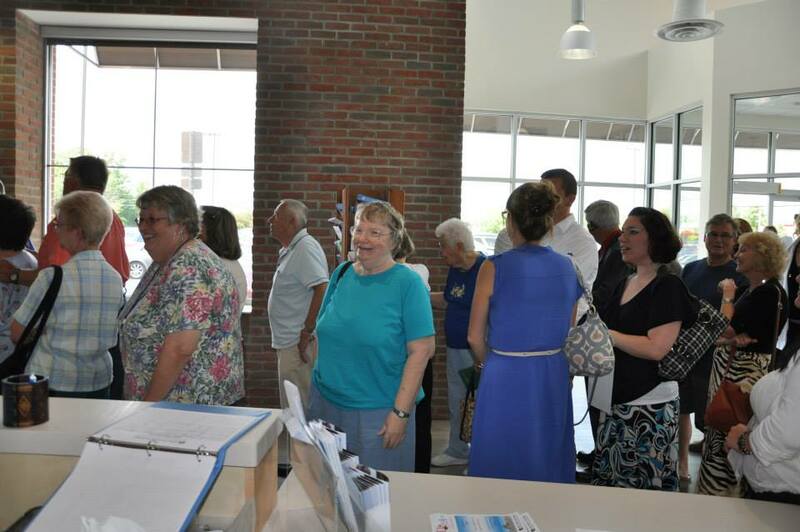 Before a crowd of hundreds, Mayor Larry Collins described June 11 as a great day for the city of Ontario, Ohio, as he and representatives from local nonprofits cut the ribbon at Hawkins Corner, a brand new shared-space complex that houses half a dozen mission-driven organizations. Representatives from the surrounding nine-county area joined 1,000 visitors that toured the 44,000-square-foot facility located on 10 acres. The ribbon-cutting ceremony and open house represented the culmination of years of dreaming and planning on the part of the District 5 Area Agency on Aging and the other tenants of Hawkins Corner. At a time when many nonprofits are seeing the need for their services balloon just as resources shrink, six agencies banded together to better serve their community. District 5 Area Agency on Aging (the Area Agency) advocates for the independence and dignity of older adults in nine counties and connects them to services and supports. Third Street Family Health Services serves county residents who are uninsured or enrolled in Medicaid. They opened a satellite clinic, Hawkins Medical Center, at the new location. Experience Works trains adults over 55 years old and helps them find employment. Visiting Nurses Association provides home healthcare in the region and will relocate its mental health team to the new complex. Richland County Habitat for Humanity will be able to expand its services at the new facility. The Alzheimer’s Association is the sixth tenant to move to Hawkins Corner. Shared-space buildings, also referred to as multi-tenant nonprofit centers, house several mission-driven organizations in the same complex. Through colocation, nonprofits can lower expenses while bolstering their missions and raising their profiles. When shared-space neighbors share similar goals and serve similar populations, their impact is compounded. In the case of Hawkins Corner, all six nonprofit tenants serve low or moderate income individuals—often, older adults—who live in the region. By collocating, agencies pool resources and improve efficiency. “[T]he synergy we generate only benefits those we all serve,” said Duana Patton, CEO of the Area Agency. For instance, the Area Agency will work closely with the on-site clinic. “We will be able to case conference more timely and efficiently,” she explained. Each organization has a private office and access to shared space and supplies. “This allows many of us to share back office resources and costs,” such as “copiers, receptionists, other operational overhead,” Patton said. Ontario, a city of about 6,200, sits a few miles west of Mansfield in Richland County, halfway between Columbus and Cleveland. One in five residents of Ontario is over the age of 65, compared to the statewide average of 14%, which means that services and supports in the area can get stretched thin. Add to that the fact the Federal Bureau of Primary Care designated rural Richland County as a Health Professional Shortage Area, and it’s easy to see why nonprofit agencies are eager to find creative solutions when times are tight. Meanwhile, on one of the most prominent intersections in the county, the corner of Park Avenue West and Lexington-Springmill Road, a former grocery store sat unused. “We would drive by that open building that was sitting empty, thinking just what a great spot that would be,” Hairston recalled. Hawkins Corner is named in honor of the individual who made the shared-space complex possible, Otis Earl Hawkins, founder of the large grocery store open at the location from 1987 until four years ago. At the age of 98, Hawkins donated the property to the Area Agency, and Hawkins Corner was on its way to becoming a reality. Patton bounced ideas off of Joe Recchie, a Columbus-based attorney and social entrepreneur. “Joe was a mentor,” she said. Recchie had previously worked with many nonprofits to help them purchase, construct, and expand their properties, including health care and educational facilities, adult day care, Head Start, and Job Service facilities. Recchie was impressed by the scope of the Area Agency’s vision and agreed to assist them. “[The Area Agency] demonstrates a very courageous and forward-thinking approach and is completely integrated in its community,” he said. Hawkins’ donation was simply the first phase of the story. Everyone involved had to be on the same page with an endeavor as ambitious as Hawkins Corner. “[The Area Agency] sought and received support throughout its service area, its executive team and board working in a highly synchronized fashion,” Recchie said. As support for the project accrued, the Area Agency had to figure out financing. The building required over $3 million worth of renovation. “I am most proud of the use of 501(c)(3) bonds to deliver the lowest cost, most beneficial nonprofit facility financing, especially when coupled with programmed giving, as is the case with Hawkins Corner,” Recchie said. The Area Agency set out to raise $500,000 and pursued multiple funding sources, including donations and grants, such as a $10,000 award from the Shelby Foundation. A donor wall at Hawkins Corner honors those who contributed funds or, like Recchie, pro bono services. Rent will also go toward the cost of renovation. The unique nature of the agencies’ collaboration may also open up new lines of capital. “We anticipate funding opportunities that we can together apply for,” Patton said. The Ohio District 5 Area Agency on Aging Foundation owns the building, and the tenants, including the Area Agency, lease space. “Our new space has allowed us to include additional shared-space partners,” Patton said, which meant the Area Agency had to determine who would be ideal neighbors. The right mix of tenants helps each organization better fulfill its mission. Hawkins Medical Center is staffed by a doctor, Ujwala Pagedar (left), and nurse, Lori Farver. Third Street Family Health Services has a main office, an OB/GYN office, and a satellite office in Mansfield. Hawkins Medical Center is its second satellite office and its first office in Ontario. The new clinic, staffed by Ujwala Pagedar, MD, and Lori Farver, CNP, has five rooms for patients and a lab that is due to open shortly. Soon, Visiting Nurses Association and the Alzheimer’s Association– Richland County mainstays that primarily serve vulnerable populations– were also on board. “This whole concept of ‘shared-space’ has been a long time coming,” said Coe. 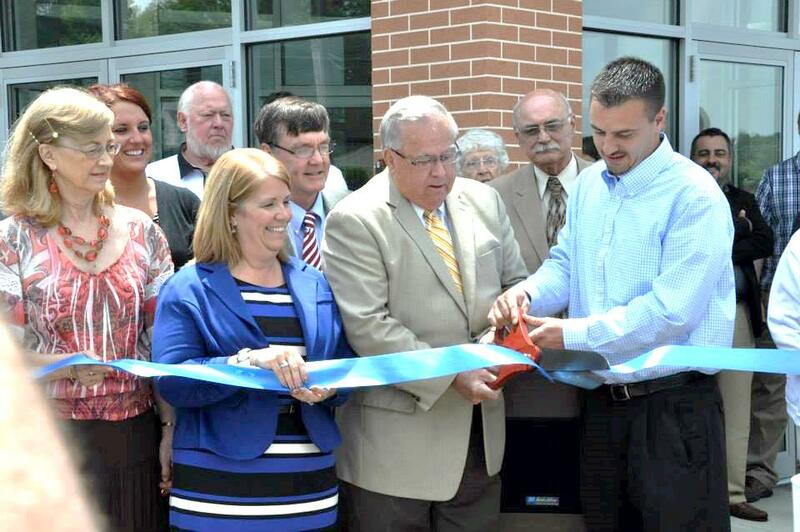 Over a year and a half passed between Hawkins’ donation and the ribbon-cutting ceremony. In October 2012, construction crews demolished the exterior of the building and then cut windows, installed plumbing, and prepped the new entrance. 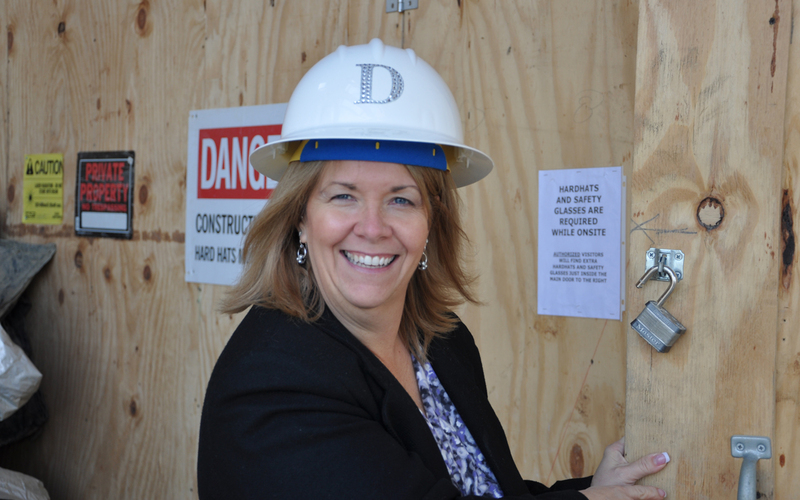 By January 2013, interior walls were framed, and by February, offices began to take shape. “While it was a lot of work and required patience and many extra hours, it was fun,” Patton said. The Area Agency shared renovation progress through a photo gallery on their web site. “I have had this vision for years and to see it come to fruition is sometimes overwhelming,” she said. “The design lends itself to improved productivity and efficiencies,” Patton said. “It is a beautiful building, and I feel privileged to be able to have my office here,” said Coe. Williams said the Hawkins Medical Center is very modern and has the feel of a private office. “People with transportation issues can easily get to Hawkins,” said Williams. She noted that bus routes had already been changed to ensure hourly stops at Hawkins Corner. In addition, “The Area Agency is working with outside communities to bus in people,” Williams said, which will allow county residents to visit several of the agencies in one day. The effects of having empowered nonprofits in a community reach far beyond the consumers they serve. Years after its inception, Hawkins Corner now stands as a testament to the ingenuity and tenacity of the organizations that call it home. 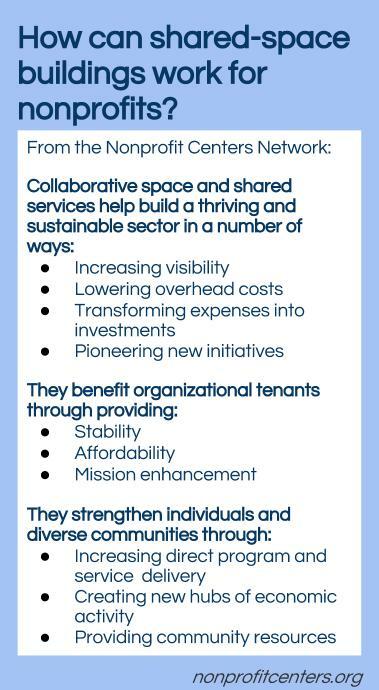 The multi-tenant nonprofit center isn’t just about sharing space. It’s also about sharing a vision for an entire community. This entry was posted in Community development and tagged Area Agency on Aging, Hawkins Corner, innovative finance, Joe Recchie, multi-tenant builds, nonprofits, shared space, shared space complex. Bookmark the permalink.